What makes one volunteer stewardship program successful and another not? While some programs are able to build a faithful pool of volunteers, other programs have a hard time keeping volunteers interested and involved. This study is evaluating how participants perceive volunteer programs, their motivations for becoming and staying involved, the relationship of their volunteer work to other recreational pursuits, and the psychological benefits of participation. A better understanding of the psychological benefits gained from participation will hopefully lead to more sensitive design of such programs and help them avoid the extreme ebb and flow of volunteer commitment. In addition, greater attention to these factors is likely to enable volunteer stewardship programs to have a more lasting effect on the larger community, as the sense of ownership and connection to the land, as well as an understanding of local ecological processes, become more commonplace. Results to date can be grouped in three categories of human needs that play important roles to volunteers. The first category, "importance of information" is expressed in the need to understand what goes on around one and to explore new directions. Concern about environmental loss and degradation, as well as the desire to make a difference, provide a strong expression of the second category, "purpose of finding meaning." Finally, the fact that volunteer efforts are carried out in the context of the natural environment means that participants are likely to have restorative experiences and be able to function more effectively in their daily lives. Thus, "supportive settings" constitute the third category of psychological benefits to volunteers. This study analyzes successful efforts by U.S. Forest Service employees at bridging the agency-non-agency boundary in ways that develop productive working relationships, generate resources, build understanding, foster trust and respect, and build concurrence on decisions. It evaluates the common characteristics linking these innovative efforts, obstacles to their more widespread application and recommends specific steps at all levels of the agency to support and encourage linkages that go beyond those formed by traditional public-participation programs. The contention that different stakeholders are likely to have divergent images of ecosystem management is based on a considerable literature on expertise. As one becomes an expert one not only acquires more knowledge but also learns to "see things" differently. Training in wildlife biology, silviculture, economics, or recreation colors what an individual focuses on, what one cares about and how a person organizes his or her world. A characteristic of becoming an expert, or an informed individual, is not being aware of how differently one has come to see, in the area of one' expertise. This study explored how members of various stakeholder groups understand "good forest management." 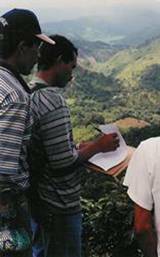 Identifying how and where the various understandings of forest management overlap and diverge is an important first step in pinpointing areas of conflict, and in improving communication and collaboration among forest stakeholders. The major technique used to accomplish these objectives was Conceptual Content Cognitive Mapping (3CM). 3CM is a tool for fostering understanding and communication about complex environmental problems. It provides a way to assess how individuals think about, or conceptualize, a particular issue. This research examines the recent on-the-ground experience with ecosystem management. Through case studies of more than one hundred ecosystem management projects located in all fifty states, we have been able to characterize the stresses facing the sites, project activities, goals and strategies, factors facilitating and opposing progress, and ideas for those seeking to carry out future ecosystem management projects. A book describing this work was published by Island Press in 1996. It is the first comprehensive guide to ecosystem management efforts for use by practitioners and decisionmakers. Electronic databases on more than 600 sites have been compiled as well. We are also developing more detailed case studies of several ecosystem management sites in Michigan and Wisconsin, and are analyzing the results of a survey of attitudes towards ecosystem management held by participants in ecosystem management efforts. Research and planning for a greenway network in the seven-county southeast Michigan region, including river corridors, rails-to-trails segments, and other linear landscape features. The goal of this project is to provide a process for the citizens and officials of the region to create an interconnected greenway system in the seven county area. An initial comparative study of greenway implementation strategies was conducted to inform the implementation process in southeast Michigan. Case studies were based on interviews with key participants, and included the following metropolitan areas: Chattanooga, Chicago, Indianapolis, Toronto, Portland OR, Minneapolis, and Maryland.